Watch movies while sharing them with Popcorn Time | goFLOSS! 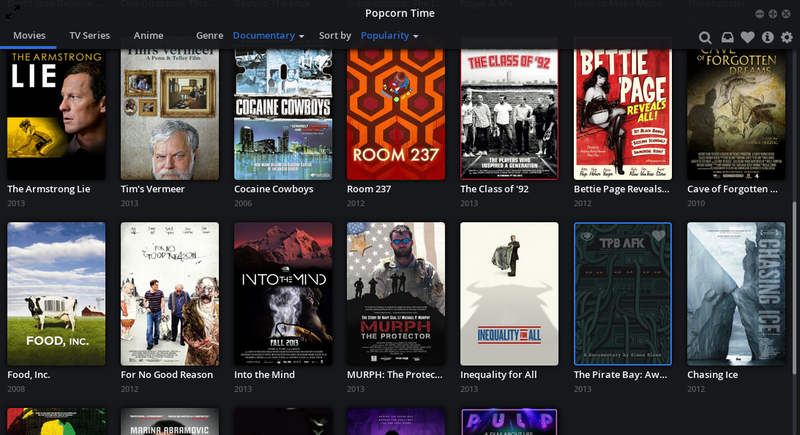 Popcorn Time is a cross-platform open-source app that lets you watch movies, shows and documentaries thanks to the BitTorrent protocol running in the background. This means you can watch videos while downloading them thanks to the protocol that links you to other peers who already have chunks of the video downloaded. It’s just like when you download something by using a torrent file or a magnet link. All this works seamlessly in the background, and as long as you are connected, the video keeps being shared for others to watch it as long as you do not empty the folder that contains the files through the settings menu (which might be a good idea as it can get massive after a while). Some people compare this client to the Netflix service because of its ease of use, although Popcorn Time does not offer streamable content like Netflix does. Popcorn time relies on decentralised sharing of files, which means it is not an illegal service. Now those other forks are also under a lot of pressure but they promise to keep fighting to always offer this service. They have notably been kicked out of GitHub thanks to the lovely Digital Millennium Copyright Act. You can still find one of them at https://popcorntime.io/ (with the development moved from GitHub to Stash), but recently, the second fork, Time4Popcorn, had to change domain names several times, and can now be found at http://popcorn-time.se/ (with its source code available here). The Time4Popcorn team recently published a blog post that asks users and supporters to promote their new website in order to make it more discoverable on search engines. I did try to find their new website by searching “Popcorn Time” on Google and could not find it in the first three pages, whereas the same search on DuckDuckGo showed it as the first results, with an “official site” label attached to it. Google have possibly been asked to make that link disappear, or it will just take a bit of time to make it reach the top of the list, as is suggested by this TechCrunch article. DuckDuckGo, on the other hand, managed to make that link appear right at the top, but the other main fork website (popcorntime.io) is nowhere to be seen in the result for some reason. For the moment, I recommend using software released by the Time4Popcorn team as the development seems more active there. They have Android and iOS versions, and there is a built-in VPN available for extra privacy. I will soon post about installing Popcorn Time on the OUYA.